These are one of my Favorite sets of Pearls, everyone asks where I got them. I wear them all the time. My daughters always want to borrow them, they have held up very well. 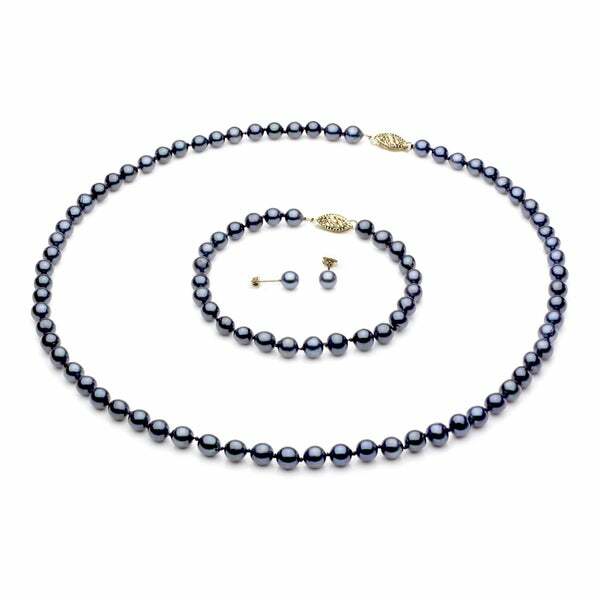 Treat yourself with the all-time classic pearls in this three-piece pearl jewelry set by DaVonna. This jewelry set includes a necklace strand, bracelet, and earrings made of cultured freshwater pearls with 14k yellow gold clasps and posts. These pearls are very pretty. A refreshing change from my white pearls. (I can let them rest) These peacock pearls have so many colors, that you can wear them with almost everything! This was a great gift! Beautiful colors that go with anything, and are very professional. The clasp is a little small, but does not deture from the overall value. I would recomend this 100%!!! When I received this set, it was not as pictured or described. Instead of filigree clasps, the necklace and bracelet I received had very small, cheap looking spring ring closures. The earrings were considerably larger than the pearls in the necklace and the bracelet, and were not a color match to them. The earrings also were not round. They had flat backs and looked like button pearls. Although the pearls in the necklace and bracelet were a lovely color, I was extremely disappointed with the entire set, since it was not what I expected. Overstock sent me a return shipping label, but offered me no explanation as to why I did not get the set that was pictured. They also did not offer to exchange the set I received for the correct set. The pearls were very pretty and the price is great. The clasp was so small and done very cheaply. I bought multiple sets for a gift for bridesmaids and am having all necklaces re-strung with a better clasp. Earings are small but are very pretty. Bracelet is like the necklace, clasp is very small. Although they were very pretty the color of the pearls were not matched, the clasp was CHEAP and tiny, very hard to manage. This was a gift and the recipient has not been able to wear the bracelet since she cannot manage the tiny clasp. If you have any craft skills or want to pay jewerly repair to put on new clasp, I would get this set and put on a decent clasp, if you don't have those skills-forget this one. I have wanted a set of black pearls for so long. When I saw these, I was ecstatic. When I received them, I was like "Oh No"! The clasp was so small that I could maneuver getting the necklace or bracelet on to wear. Had to return. Sorry. This was indeed a nice set. It was a present for my daughter and she really loved them and wears them requently. The only drawback about the set is that the clasps are small and it would be difficult for some people to put on. But otherwise, it's a lovely set. the set is weighty and has a feel of quality. the pearls are not a perfect match however the adds to the charm. my wife wears them with everything ,the colors change depending on what they are being worn with. i recommend for someone who wants something different to wear everyday. Runs small, not for large neck and wrists. Pearl set was beautiful, but necklace was 2" short. Had to give to my saragate daughter. This set goes with so many things! But as stated in other reviews the locks are small and hard to open and close. Since I knew this from other reviews I planned ahead and asked my daughter to redo them when I received the set. Can't wait till she's done with it so I can start wearing it again! It's a really nice set! The only thing I noticed little knots (1 on Bracelet, 1 on Necklace)...Are they supposed to be there, I wonder?....Otherwise, very nice color..
Just the combination of items for a very nice gift! "The title says "peacock" but the description say "black". Which is more accurate?"